Some complained that this blog is too dull and too serious. So I try to balance the "seriousness" by interlacing with some light reading. So here it is. To counter Elder Sister Lotus, China now has Younger Sister (Meimei) Heavenly (Tian) Fairy (Xian): Tianxian MM ("天仙MM") was first posted by a driver/photographer who stumbled upon a minority village (甘堡屯) in the mountain in Western Sichuan. The orignal poster called her Tianxian because there is a Chinese phrase for surprised beauty called Xian Nuu Xia Fan (and angel fell into the mundane world [by accident] ). Tianxian MM (her real name is Erma Ina) quick reached a bigger (and well deserved) fame than Fuyong JJ. She is a village girl from the minority group of qiang (羌), an ethnic group related to the Tibetans. Tianxian MM is not as stunning as the TV starlet Zhang Lanlan. I guess her appeal is from her innocence and purity, in the unpolluted rural area, and a culture unspoiled by the commercialized capitalistic Han. This is an example that the ethnic conflict in China is much milder than in other countries, when minorities are generally admired and appreciated (yes, esp the girls, of course. In Super Girl Vocie Show, the minority contestants were always given special applauses and cheers from the Han audience). In fact, other than Han arrogance over the minorities (just like Shanghainese arrogance over Anhui/Northern Jiangsu), minorities are fairly treated and well respected in China (similarly for Tibetans as a minority and culture - the Tibet prosecution theories in the West were much exaggerated, in that Han people suffered the same fate during cultural revolution). e.g. one-child policy does not apply to non-Han ethnci groups, and many children of cross marriage choose to identify themselves as minority group, because of better education (and other) opportunities via an "affirmative" policy. Note also that Muslim is considered as a minority group, even though genetically many are Han Chinese. See also the pre-fame photo of this innocent girl here (original is in auto.tom.com/forum) and summarized media report there. 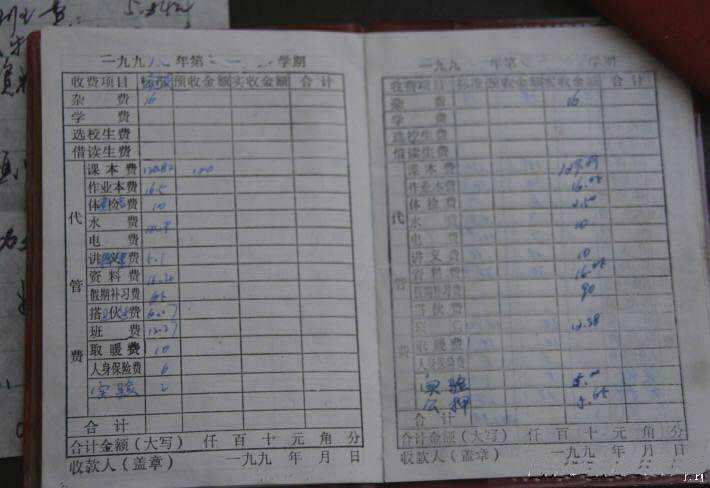 In the "pre-fame thread" the poster looked at TXMM's education bill in 1998, and expressed his guilty that he could have paid for one year's education (textbooks and fees) for this girl if he has one less hotpot meal. Let's be (wishfully) optimistic, and hope that Tianxian MM can become the ambassador for ethnic harmony and rural education. update (Sep20): now ESWN did cover it :) so my laziness is justified. I knew his stories are always more interesting to read than the dull ones here. update (Sep20): some people questioned about TXMM's finger nails and other feature. I can testify that this is not uncommon. TXMM has been a migrant worker working in Chengdu, and went back to the village to take care of her ill father. She spent some time in the city and learned about the nail polishing job. 1) It is very common for migrant workers to skip work for a few months and go home, either because of harvest/sowing season, or family problem, or unhappy work environment. Jobs are always easy to find again. 2) When we talk about migrant workers, we always think about those who move from inland provinces to the coastal cities. In reality every city in China has migrant worker. Young women from Sichuan villages would work in small cities in Sichuan, larger city (Chengdu), nearby province (Wuhan), or coastal cities (Dongguan/Shenzhen), all depends on how far she is willing to be away from her mom. The closer they are from home, the more often they would take breaks back home in between jobs. ...the reason the girl became friend with a stranger from the city: her brother-inlaw and sister-in-law despise the poor village but the photographer was able to respect the villagers. "她说我之所以没扫你兴、叫你爬，是你的那份真诚与固执打动了我。我嫂子嫁我大哥后，县城里的人，不得了哦，回寨子就一次，嫌这嫌那，住一天就奔山了。我姐夫，城里人哟，也总共来一次就奔山了，还丢下一堆酸酸话。你来，和乡亲们处得那么好，对爹妈、老人们那么尊重，对山娃儿些那么爱，我才一直在配合你到处走。你知道吗，你一走，闲言碎语有多少？别把山寨想得那么简单，长舌婆多的是！我回来住几个月议论就很多了！没出息、耍垮方了的人才会回来，这就是他们公认的道理"
- The satellite dish. Chinese government encouraged satellite TV in early 1990s, the objective was to cover remote areas like this village. Each province has a Satellite TV Station, in mountainous province Guizhou Satellite TV Station is probably more popular than network TV. The famed Super Girl was produced by Hunan STV. TXMM is a fan of Li Yuchun and Zhou Bichang. "There is another reason I tried to help TXMM accepted by the mass. I have business in Switzerland, my wife and daughter live there. One day, a Swiss neighbor came to tell my wife that he learn Sister Lotus is now the idol of the Chinese people. I felt this hard to take, and I wanted to let them know what the majority of the Chinese think, and that we appreciate something that is not neccessarily strange or abnormal or eccentric...I think TXMM represents a healthy, innocent, ethnic image. although it is harder to reach fame quickly being in the mainstream, I think if there is beauty, there will be appreciation. Now she made it......I am just a common person, I believe in the power of the internet." "“我现在努力让大家接受‘天仙MM’其实还有另一个重要的原因。”浪兄提起芙蓉姐姐和木子美等人物的时候十分激动。　“我是在瑞士做生意的，妻子和女儿也都在瑞士生活，有一天我妻子打电话来告诉我一件事情让我十分吃惊，你猜是什么事？她在和瑞士的老外邻居聊天的时候，老外跟我妻子说：‘我知道你们中国人现在的偶像是芙蓉姐姐！’”　“我当时就觉得难以接受这个事情！”浪兄的声音提高了八度，“虽然说我是一个四十多岁的老男人了，可能也不是那么时髦，但是在我看来，芙蓉姐姐或者类似木子美这样人，实在难以从她们身上感受到美———你觉得她们美么？她们红到了老外都知道了实在让我难以接受。我就想，难道现在的网络世界里都必须靠脱、必须靠一些比较病态的东西才能让人们关注么？我不相信！”　“相反，羌族妹妹是一个非常健康的形象出现的。在我的眼里，她已经抽象化成了一种美丽的、民族的、清纯的形象，我相信这样的正面形象一定会被广为接受的。我承认，正面的形象实在是太难走红了，要红到一种火暴的状态更是困难，但是只要是美的，总会有人欣赏！现在她已经做到了。”　我只是一个普通人，我相信网络的力量"
I've seen a Yahoo 360° page on her stating it was her's. Since I saw that I searched the net on everything about her. Also, frequently looked into CCTV9 and CCTV4 (available here via satellite) 'cos I saw pictures of her CCTV appearance and thought she must be a TV Star in Your country. Her sudden popularity I think is no surprise. According to the photographs she must be at least one of the worlds most beautyfull women. Unfortunately living in far away China. However mean your gold in wow life is,buy wow gold meet it and live it ;wow gold cheap do not shun it and call it hard names.It is not so bad as you are.It looks poorest when you are richest.The fault-finder will find faults in paradise.wow gold kaufen love your life,poor as it is.maple meso You may perhaps have some pleasant,thrilling,maplestory power leveling glorious hourss,even in a poor-house.The setting sun is reflected from the windows of the alms-house as brightly as from the rich man's abode;the snow melts before its door as early in the spring.sell wow gold I do not see but a quiet mind may live as contentedly there,cheap mesos and have as cheering thoughts,as in a palace.The town's poor seem to me often to live the most independent lives of any.May be they are simply great enough to billig wow gold receive without misgiving.Most think that they are above being supported by the town;powerlevel but it often happens that buy maplestory mesos they are not above supporting themselves by dishonest means.which should be more disreputable.Cultivate poverty like a garden herb,like sage.Do not trouble wow powerleveln yourself much to get new things,maple mesos whether clothes or friends,Turn the old,archlord power leveling return to them.Things do not change;we change.Sell your clothes and keep your thoughts. The cost of not being a "democracy"